A damp basement that's left untreated can cause musty odors, basement mold and mildew. This can cause health problems and affect the air quality throughout your home. Even with a waterproofing system, basement dampness can still be a problem. Investing in a dehumidifier is a cost-effective way to dry your damp basement. A SaniDry™ dehumidifier from Basement Systems makes it easy to control humidity in even the most challenging basement conditions. Super efficient - SaniDry dehumidifiers are ENERGY STAR® rated and use the same amount of energy as standard dehumidifiers. No water tank or reservoir to empty - SaniDry models are designed to drain into a sump pump or to pump condensate outdoors. Air filtration - A built-in air filter traps dust, mold spores and other particulates for cleaner air. High-performance - SaniDry dehumidifiers are rated at 95 pints per day minimum capacity. Duct compatible - The SaniDry can be located in an unfinished space and connected to the living area with ducts. 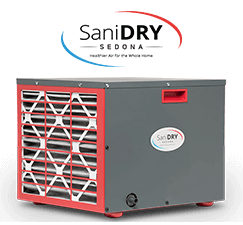 Easy humidity control - The SaniDry Sedona and XP have a built-in humidistat and digital controls that allow you to set the target humidity level and let the machine do the rest. A suitcase-size household dehumidifier has a fairly small fan that blows moist air over an equally small cooling coil. While this type of unit can perform effectively in an upstairs room, it’s vastly overmatched by the basement’s size, humidity level and lower temperatures. SaniDry dehumidifiers are at their best under the worst basement conditions. 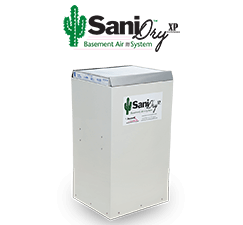 With a SaniDry dehumidifier you simply get more of everything: greater drying capacity, more durable, reliable performance, improved energy efficiency, and the added benefit of air cleaning. To schedule a consultation and get an estimate on SaniDry dehumidifier installation, contact us today to find your local Basement Systems contractor.